These gadgets and machines will make total immersion in the rapidly growing 3D Internet Cyberspace possible – the Matrix is coming closer! You can connect this video player to your iPhone or iPod. Soon we’ll be able to connect it to the net, and surf 3D websites with it. 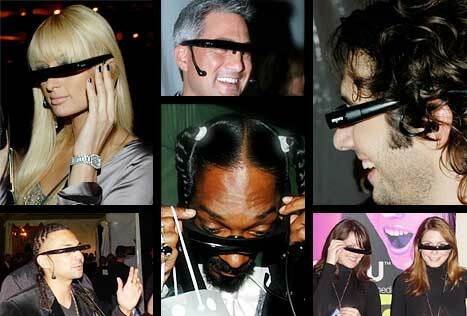 Even Paris Hilton tried this personal media viewer by Myvu! 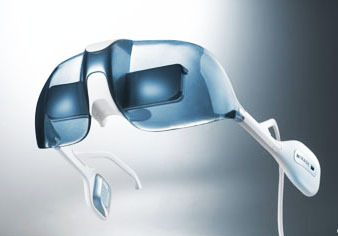 Insiders already call this gadget “the Googgles”. Anybody who puts on this device will be immersed in a three dimensional ‘stereo-vision’ virtual reality called 3dLife. 3dLife is a pun referring to the three dimensional nature of the interface, but also a reference to the increasingly popular Second Life virtual reality. The Google Goggles may also function as a phone, but that is not their main purpose. 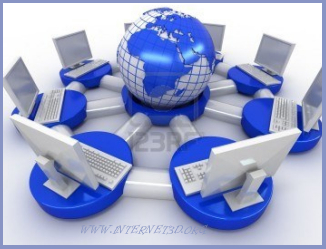 The main purpose is to give users a three dimensional interface with the Internet. Google builds this device with Israel-based Mirage Innovations. They call their gadget-technology LightVu Personal Viewer. Mirage Innovations try to specifically design their LightVu eyewear to eliminate the effects of cyberstress (nausea, dizziness, disorientation). Philips‘ 3D TV (WOW vx). Philips has added a new immersive experience with the WOWvx technology. With the Philips 3D WOW displays you can experience 3D television without the use of those special glasses that one normally has to wear. The 3D display is suitable for simultaneous use by a number of viewers thanks to its large viewing zone. HoloVizio, while first looking like just another 3D screen, completely changes the approach to three-dimensional displays using voxels instead of pixels. Each voxel can project multiple light beams of different intensity and colors and it does so in several directions, simultaneously. Anyone standing around the monitor will actually see an object from a different perspective, with no need for goggles or other stereoscopic tricks. The HoloVizio sets a standard for 3D visualisation as viewers can see a 3D image on the screen, quite similarly as they would see an object in reality. 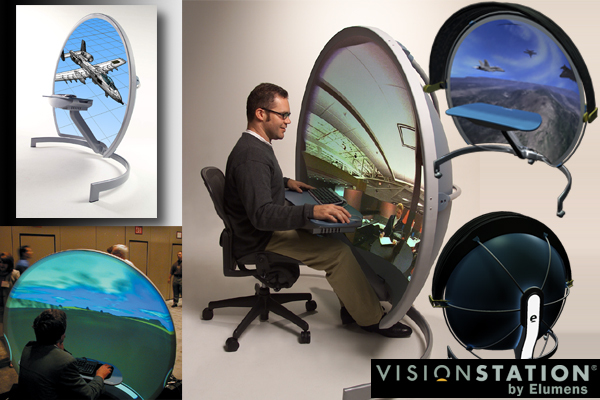 Elumens‘ fully immersive 160° display Visionstation. The VisionStation by Elumens is a portable and low-cost 3D immersive viewing system with a wide range of real-world applications. It can be used with applications such as: Simulation and training, oil and gas exploration, product presentation and entertainment applications. Standard flat-screen applications can display a field of view of no more than 60°. The Elumens VisionStation however allows for a fully immersive display of 160°. The VisionStation’s ultra-wide field of view creates an amazing sense of space and depth, without need for goggles or glasses. The large size of the VisionStation screen (1.5 meters) also helps promote an excellent sense of immersive 3D. Actuality Systems‘ Perspecta Spatial 3-D System. Perspecta is a hologram-like fisheye three-dimensional display that allows users to view moving objects from any angle with the unaided eye, simply by walking around them as you would if you were looking at real 3D objects. Users experience an all-encompassing 360 degree view and simultaneous multi view collaboration without goggles or any assistive device. Perspecta consists of a rotating round white polymer screen resting on a box containing software, hardware, and an optical system. Slices of successive 2D images generate moving images that seemingly float inside a Moneygram transferencia de dinero crystal ball-like structure. As they are rapidly projected one after another onto the screen, they create the illusion of a real 3D image. Actuality Systems develops hardware/software-based visualization products for medical imaging, the earth sciences (oil/gas), and consumer electronics. 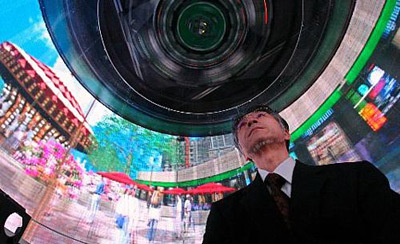 University of Tokyo‘s TWISTER 360-degree rotating 3D display. TWISTER (Telexistence Wide-angle Immersive STEReoscope) is an immersive full-color autostereoscopic display, designed for a face-to-face telecommunication system called ‘mutual telexistence’, where people in distant locations can communicate as if they were in the same virtual three dimensional space. Researchers from the University of Tokyo, led by Susumu Tachi, have developed a unique display that allows viewers to be immersed in a 3D video environment. Professor Tachi has spent years researching and developing a cylindrical display with over 50,000 LEDs positioned in columns. The display rotates around your head at 1.6 revolutions per second, the LEDs show a different image to each of your eyes, creating the illusion of a 3D image. At the moment, all you can watch in TWISTER are pre-recorded 3D video from a source such as a computer, but the researchers are currently developing 3D videophone capabilities to the system by mounting a camera system that can capture 3D images of the person inside TWISTER. A 3D mouse lets you move effortlessly in all dimensions. Move the 3D mouse controller cap to zoom, pan and rotate simultaneously. 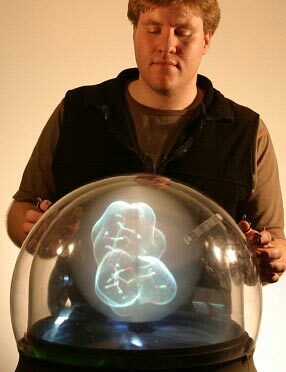 The 3D mouse is a virtual extension of your body – and the ideal way to navigate virtual worlds like Second Life. The Space Navigator is designed for precise control over 3D objects in virtual worlds. Move, fly and build effortlessly without having to think about keyboard commands, which makes the experience more lifelike. Controlling your avatar with this 3D mouse is fluid and effortless. Walk or fly spontaneously, with ease. In flycam mode you just move the cap in all directions to fly over the landscape and through the virtual world. Vlad Bjornson‘s movie impressively demonstrates how the Space Navigator mouse improves the user-experience in cyberspace. Join him for a flight around the virtual Africa cyberworld in Second Life. 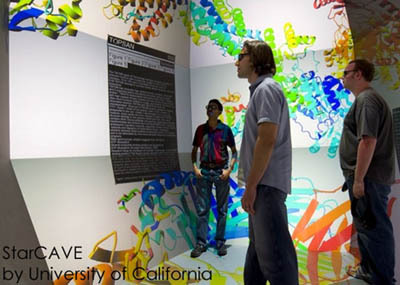 The StarCAVE at the University of California, San Diego is a virtual-reality environment which allows groups of scientists to explore worlds as big as the cosmos and as small as nanoparticles. Users of this virtual reality can interact with the visuals on the 360-degree display by pointing a “wand” which results in flying through the 3-D images and zoom in or out. The exact position of the wand and the user is determined by a multi-camera wireless tracking system. Though Virtual Reality is moving quickly towards realism on many fronts, one of the major problems in creating realistic immersion is that of walking. If people walk around with a VR headset on, they might bump into something. Researchers are questing for a suitable device which offers proprioceptive feedback for virtual reality walking. VirtuSphere Inc.‘s Full Body Immersion Virtual Reality Virtusphere. 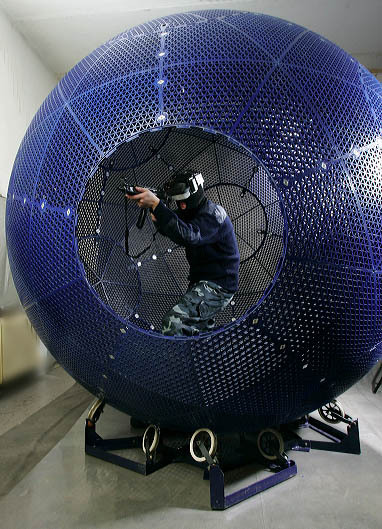 The Virtusphere allows lifelike movements in cyberspace by letting the user walk ‘inside’ computer generated virtual space. The user could carry out "virtual explorations" of museums or a new city, or conduct police or military training in a much more realistic and immersive manner than that which has been possible until now. This unique simulation platform allows six degrees of freedom. One can walk, crawl and run over virtually unlimited distances in all directions. Virtusphere can be compatible with all computer based simulations. 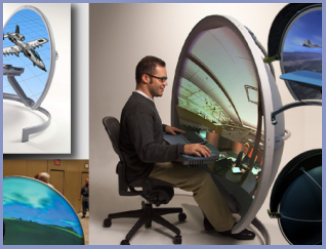 The user enters the sphere with a head mounted display, which permits virtual vision in any direction. As the user moves, the sensors under the sphere transmit information about the users speed and direction to the computer. The user looks at the head mounted display and sees a virtual three dimensional space which is generated by the computer in response to his-or-her movements. The user can interact with objects in virtual space with the help of a special manipulator.